Noah James Hittner: "Flesh & Metal"
Opening with the haunting "You," Noah James Hittner's 2014 release Flesh & Metal is more of the former and less of the latter, at least stylistically. The album's mellowness comes from its tightly compressed vocal tracks laid over a blend of acoustic, effect-laden guitars and an assortment of old school, almost MIDI-like electronic drum tracks. "Wonder" meshes the styles of an 80s Casio keyboard 'Demo' track and a Pet Shop Boys songwriting rough. Songs like "Valley of the Sine Wave" bring to the table a bit more organic acoustic guitar and Noah's more organic singer/songwriter roots. But as with the rest of the album, drum loops and crystal-clean vocals bring about a more mechanical aspect to the songs. An almost New Age-y feel comes through in "The Pines," "Stephanie's Interlude," and "When, Indeed," all instrumentals fueled Noah's acoustic guitar. But the majority of the record includes lyrics and the aforementioned electronic percussion. Closing out the record is "Chasing," a guitar/vocal feature sans any drums or bass guitar. 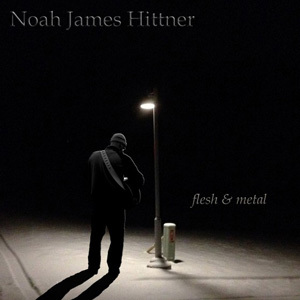 Part flesh (of organic nature) and part metal (of electronic instrument derivation), Noah James Hittner's Flesh & Metal brings together these two aspects of his musical nature.